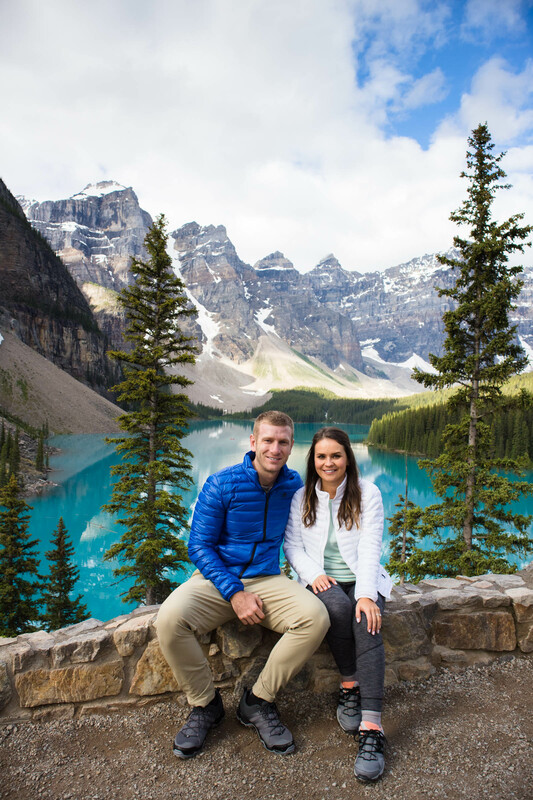 I’m so excited to share all the details from our recent trip to Alberta, Canada in today’s Banff travel guide! 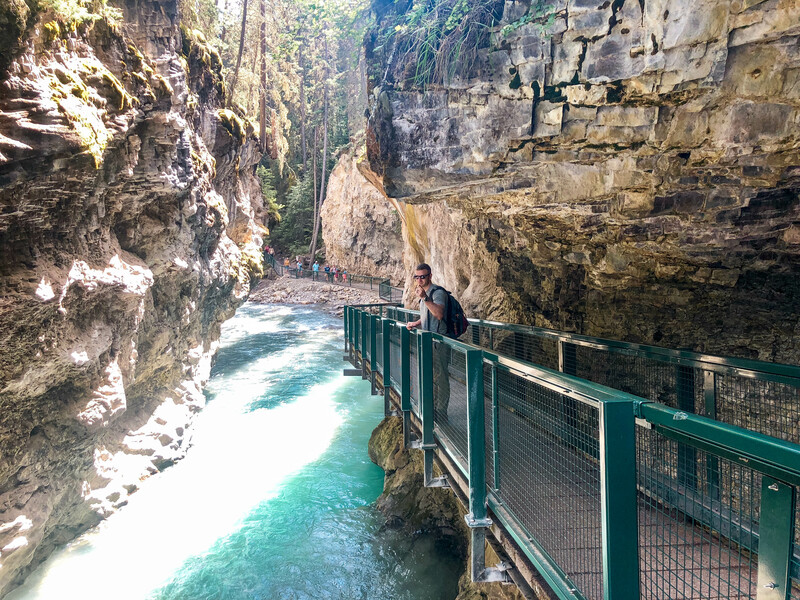 This post was highly requested and to anyone considering planning a trip… do it!! 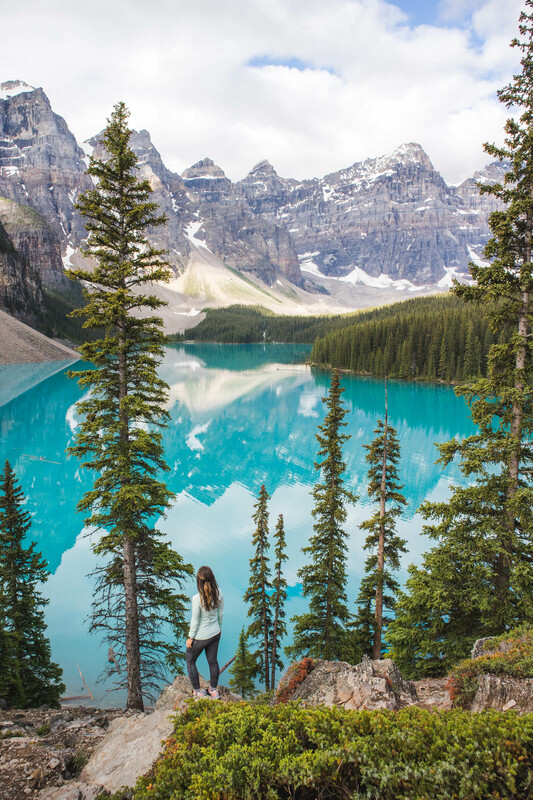 From the towering mountains to the turquoise lakes, I was in awe of all the beauty surrounding us. 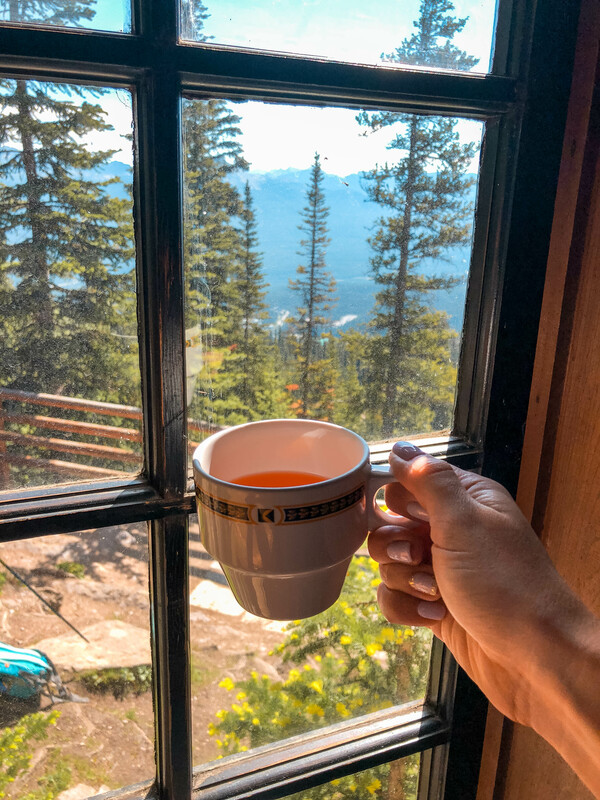 In today’s post I’ll be covering where we stayed, our hikes, restaurant recommendations, and more. Let’s get to it! 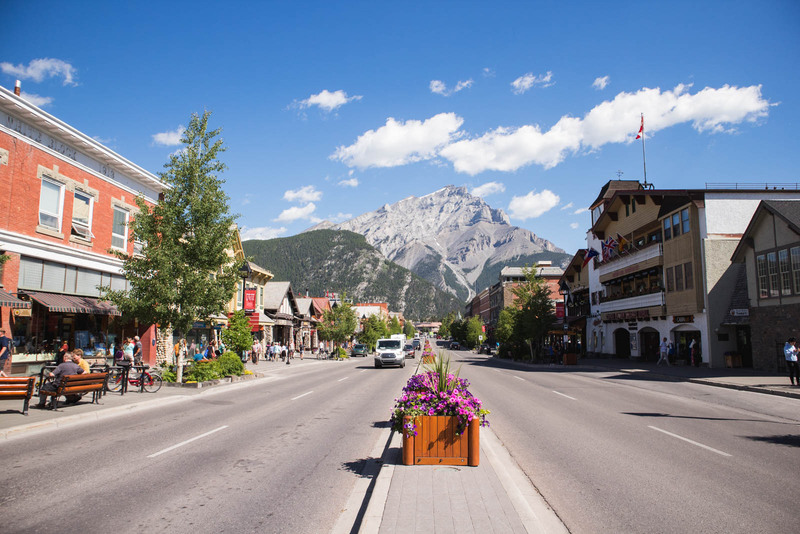 When visiting Banff National Park, the main towns to stay in are Canmore, Banff and Lake Louise. 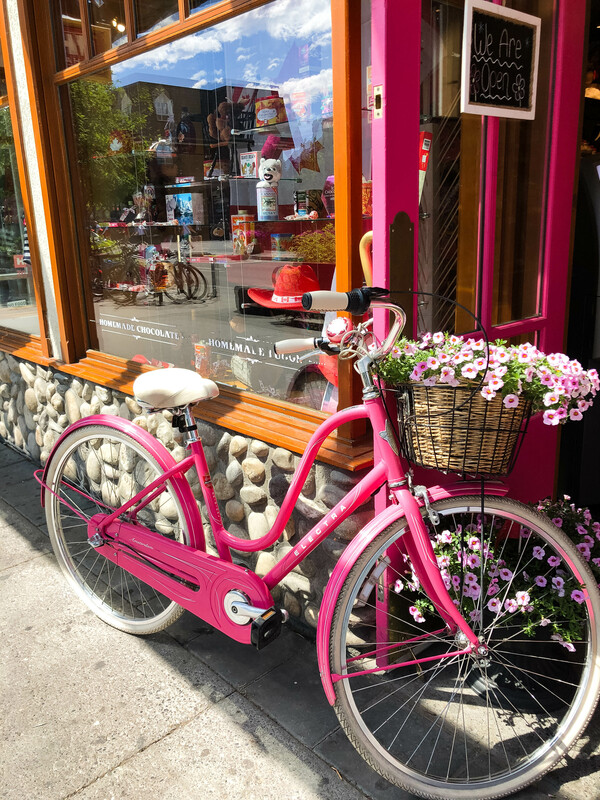 We decided downtown Banff was the way to go because of all the cute shops and restaurants that were steps away. 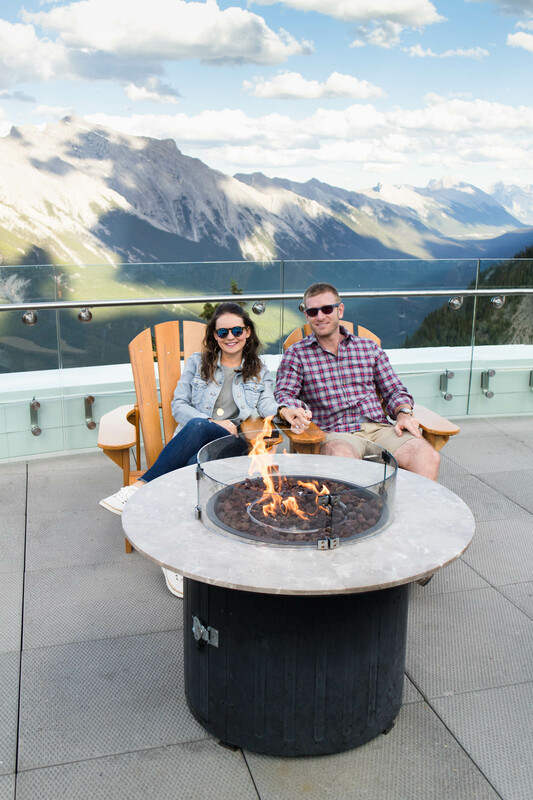 We stayed at the Mount Royal Hotel located in the heart of Banff and it had just been completely renovated and opened a week before we arrived. You can’t beat the location, it’s walkable to everything (and across the street from a Starbucks). The rooms were nice- comfy beds and modern bathrooms. The only weird thing was they didn’t have hangers in the armoire. 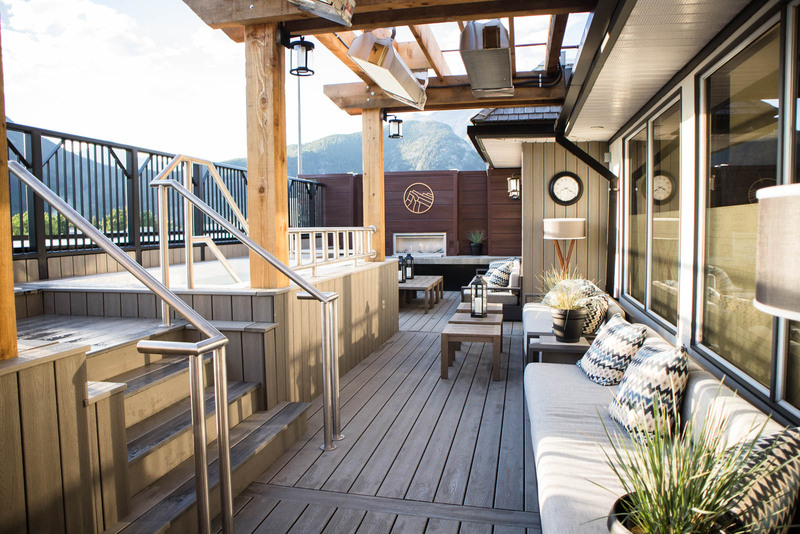 What sets this hotel apart from the others is the rooftop area (the Cascade Lounge). 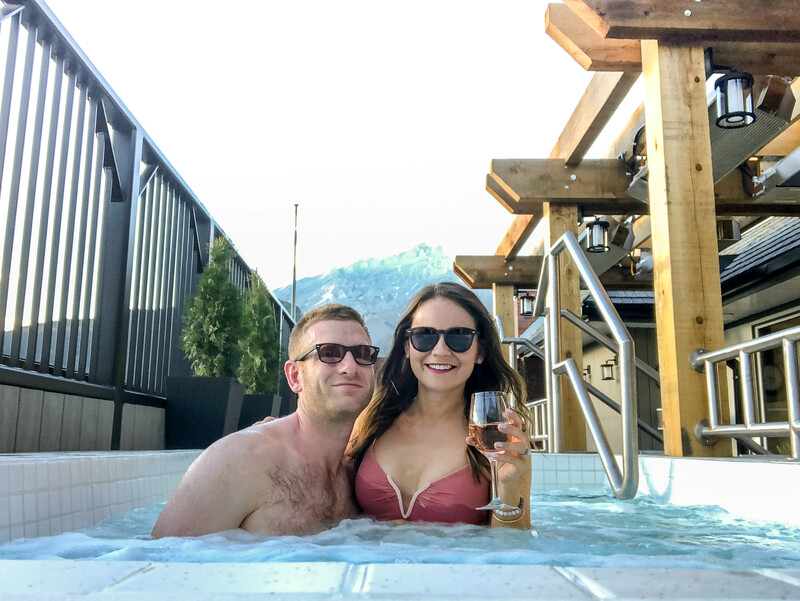 You get a killer view of the Canadian rockies complete with hot tubs and drink service, the perfect way to end a day of hiking! 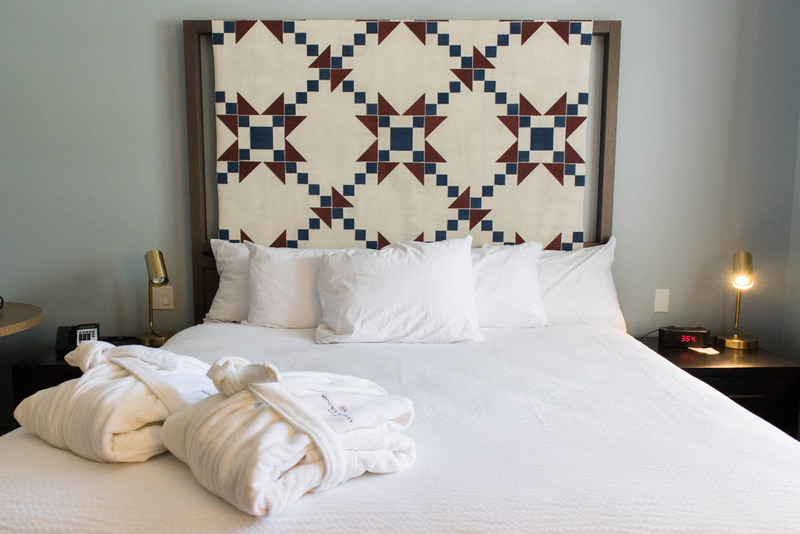 I would definitely stay here again and highly recommend it if you’re planning a trip. 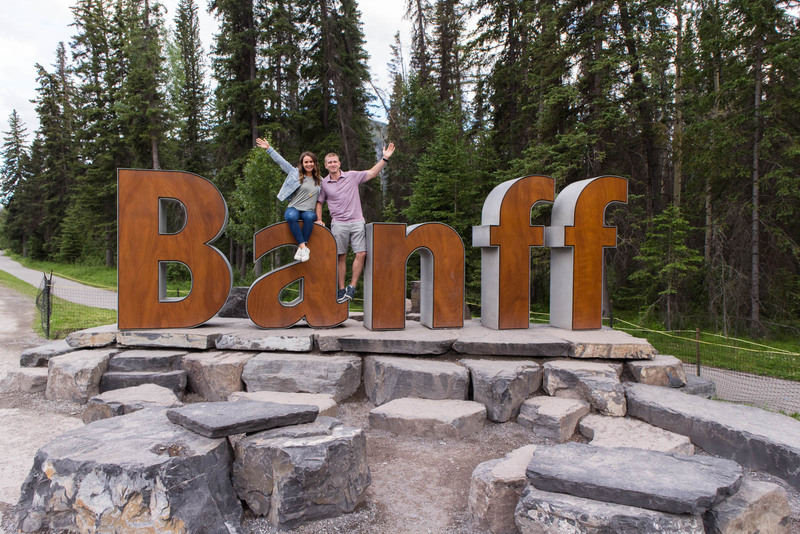 July & August are the most popular times to visit Banff due to the nice summer weather- it was SO nice to escape the 90 degree temps in Charlotte. The mornings were in the low 50s and would get up to a high of mid-70s to low 80s. You have to be prepared for all types of weather here- check out my packing guide here. 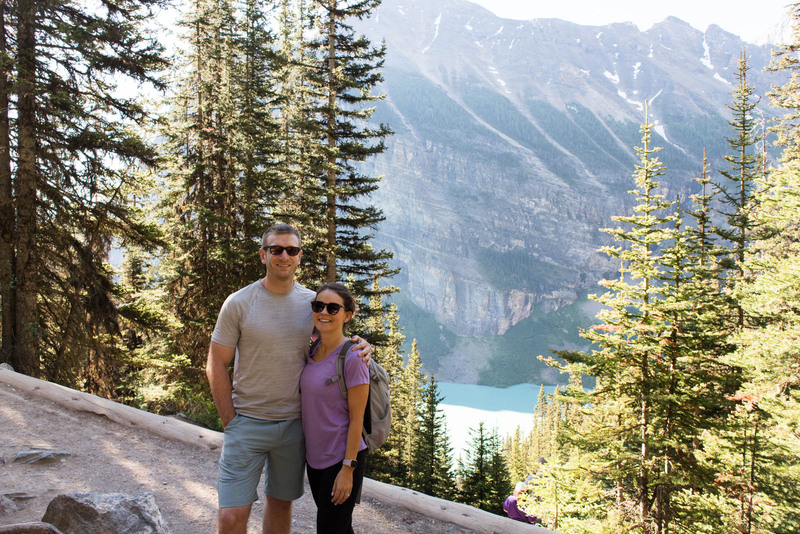 Our very first destination of the trip was Moraine Lake, mostly because we knew we needed to get there super early. 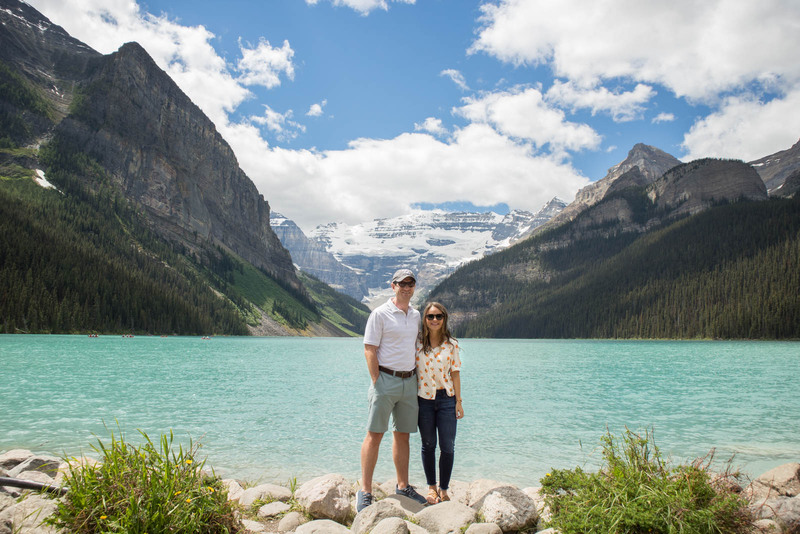 I would say this is the 2nd most popular lake to visit in Banff National Park, second to Lake Louise. 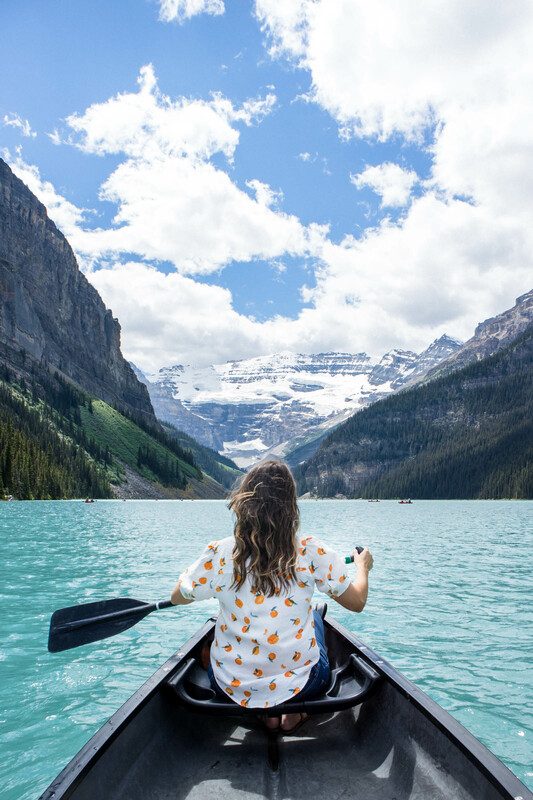 The beauty of this lake is unreal, it truly looks like you just walked into a postcard. 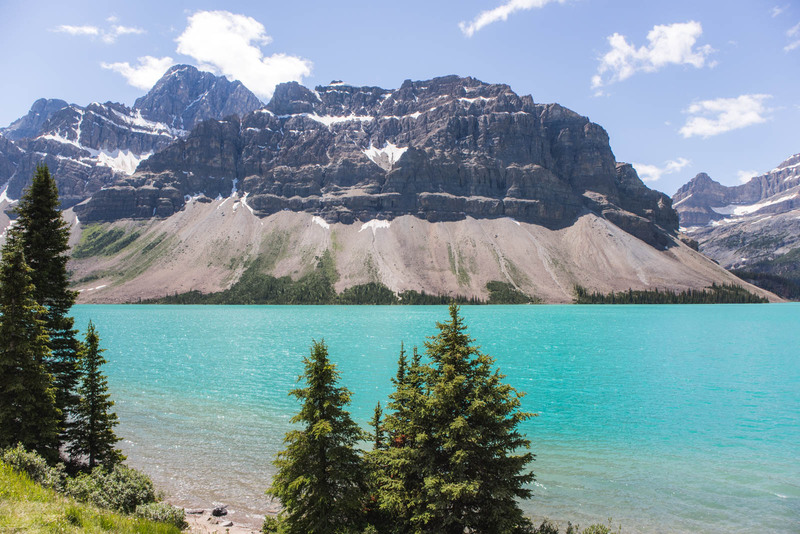 The reason the lakes in Banff are so popular is the beautiful turquoise color which results from the glacial silt deposits in the water. 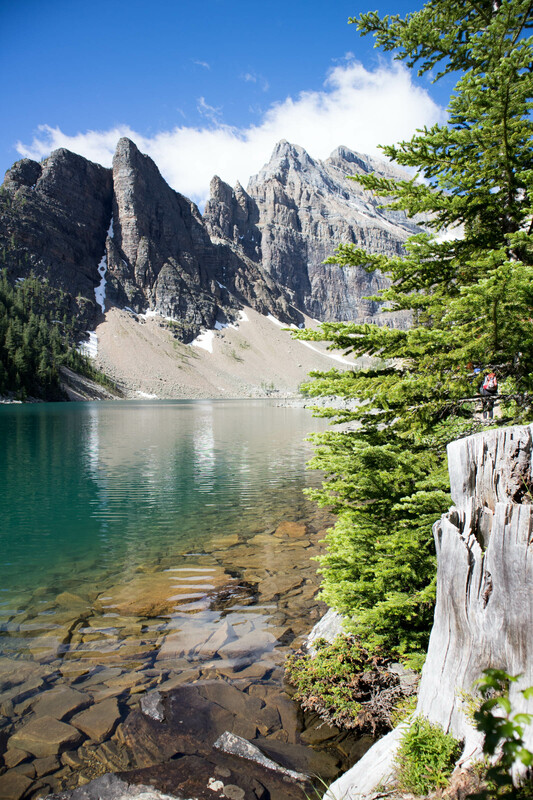 The “hike” that everyone does at Moraine Lake is the Rockpile Trail, which I wouldn’t even consider a hike. It’s about a 5 minute walk to the top of the rock pile to get that picturesque backdrop that you always see. There are several hikes around the lake but we just did the Lakeshore trail which was flat and very easy, took about 45 minutes round trip. Pro Tip: Like I mentioned before, get there early. We arrived on a weekday at 7:15am and apparently that wasn’t early enough. The parking area is pretty small so they will completely block the road leading to the lake until more spaces open up. Just past the road on the right is an area where you can pull off and wait. I waited by the picnic tables closest to the road and Ryan waited in the line of cars parked at the other end. As soon as the attendants waved us down to let us know they were opening the road, I texted him and he was the first to pull out. 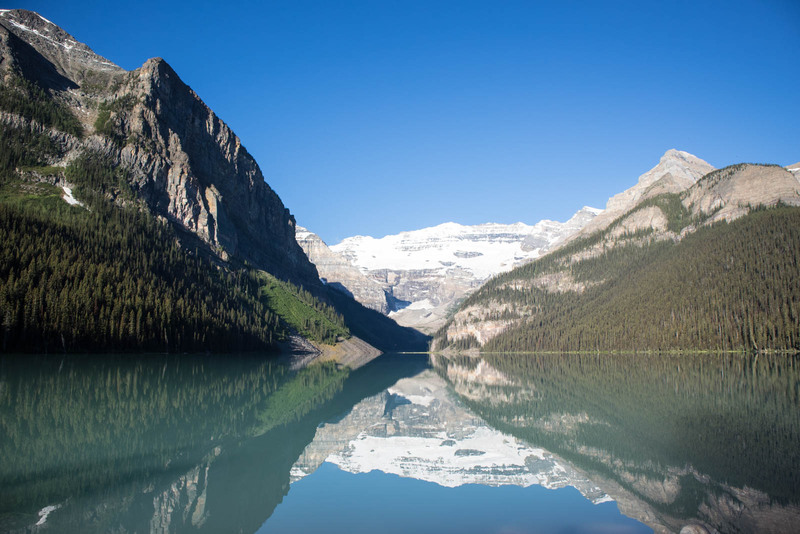 We drove by this road a few other times and it was always blocked off so this is your best bet to get in, unless you want to pay for a shuttle from Lake Louise. 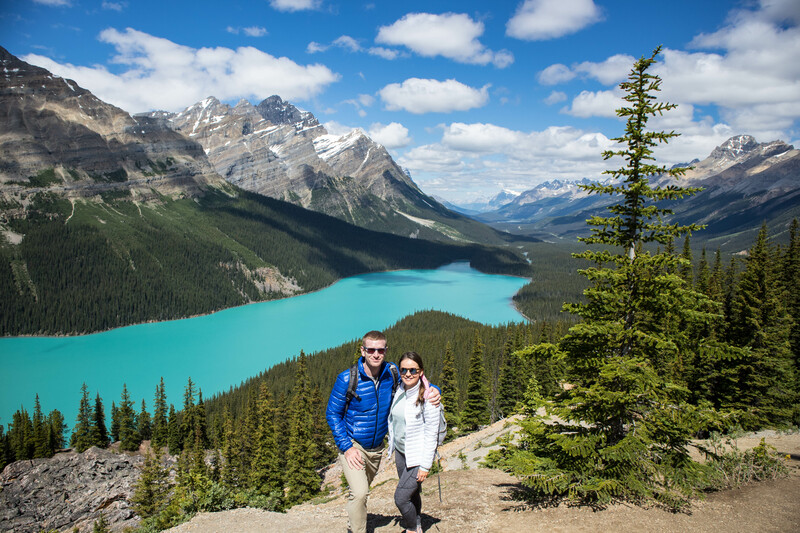 To be honest, we were debating on whether to visit Peyto Lake due to the distance (almost 2 hours from Banff and about 40 minutes from Lake Louise). 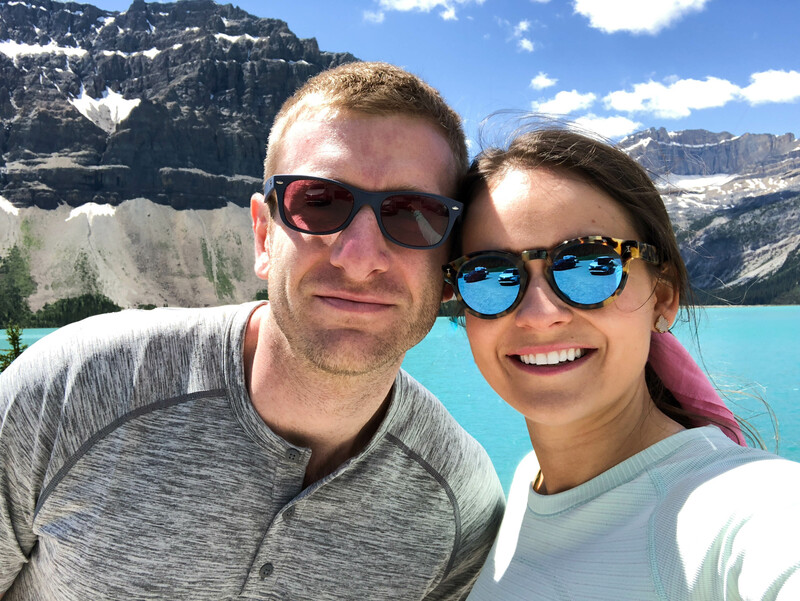 Since we were already out at Moraine Lake and that hike didn’t take too long, we decided to head up the Icefields Parkway and are SO glad we did. It’s quite a steep (but short) hike to the overlook of the lake. I try not to get a lot of people in my photos but it was quite crowded. If you hop over the fence you can sneak down for a better, unobstructed view. The lake was the brightest color of turquoise I’ve seen (probably because we were so high up) and the surrounding mountain ranges were breathtaking. 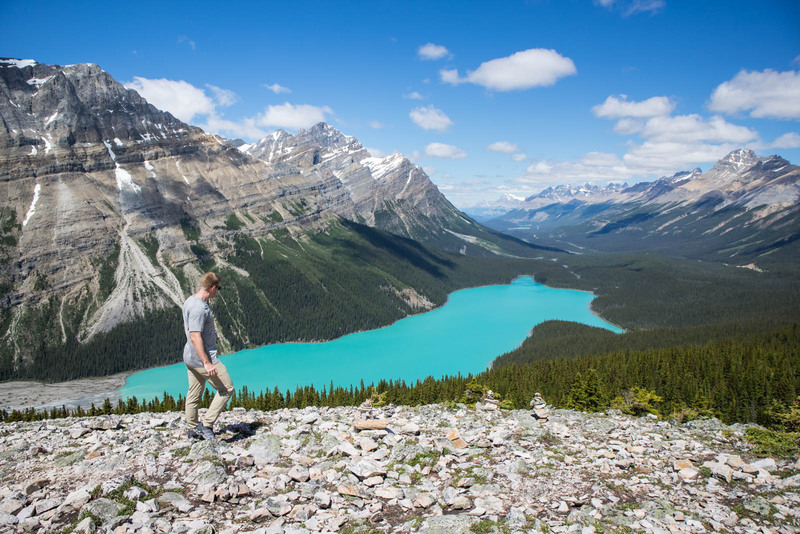 We decided to keep hiking the loop and went all the way up Bow Summit to get THE most stunning view I’ve ever seen. There were only 4 other hikers up there- no crowds, just you and nature. Ps. You will definitely want good hiking shoes for this trail, it is super steep and rocky, but the views are so worth it. 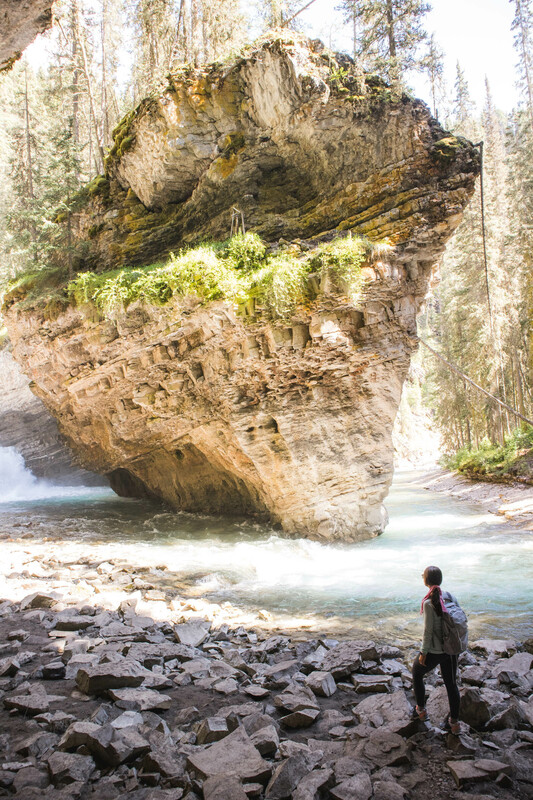 This is a popular hike in Banff which is situated around several waterfalls and a river. 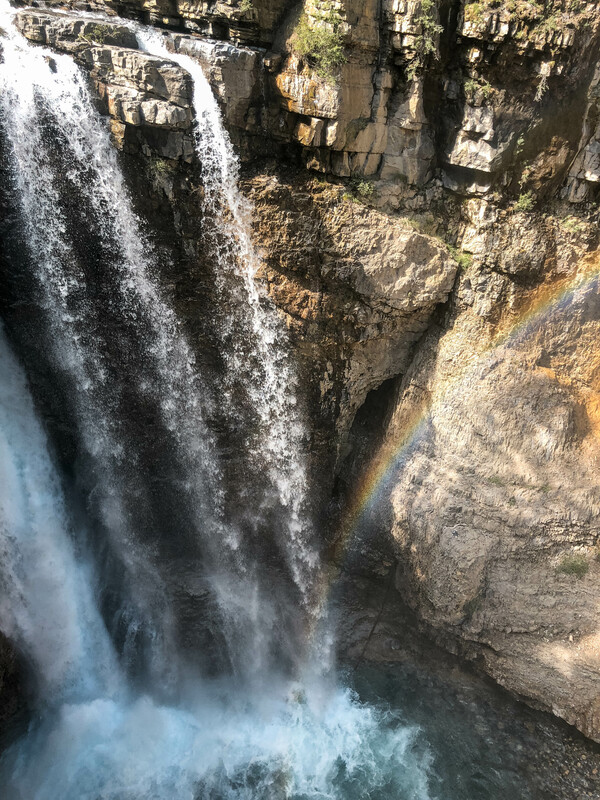 There are walkways placed right up against the rocks and you can even climb through one of the rock walls to get up close and personal with the lower falls (ps. you’ll get sprayed a little so be prepared). 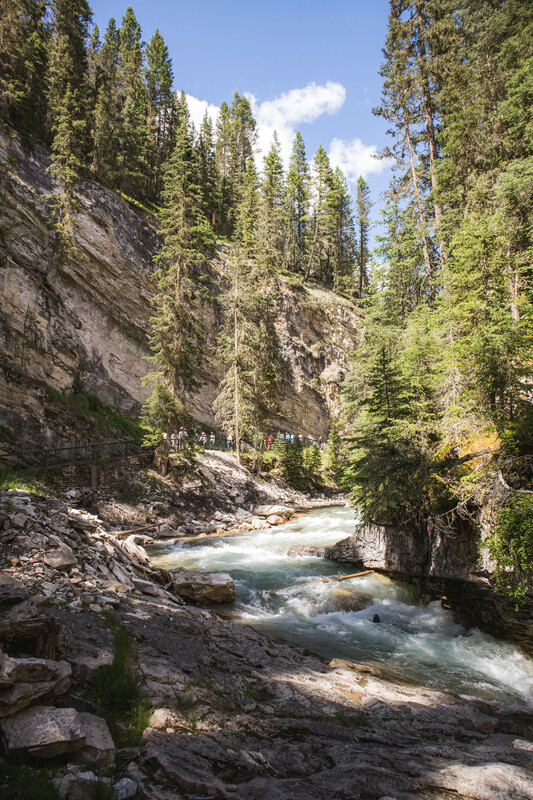 The hike to lower falls is pretty easy but gets a little steeper as you go to the upper falls. 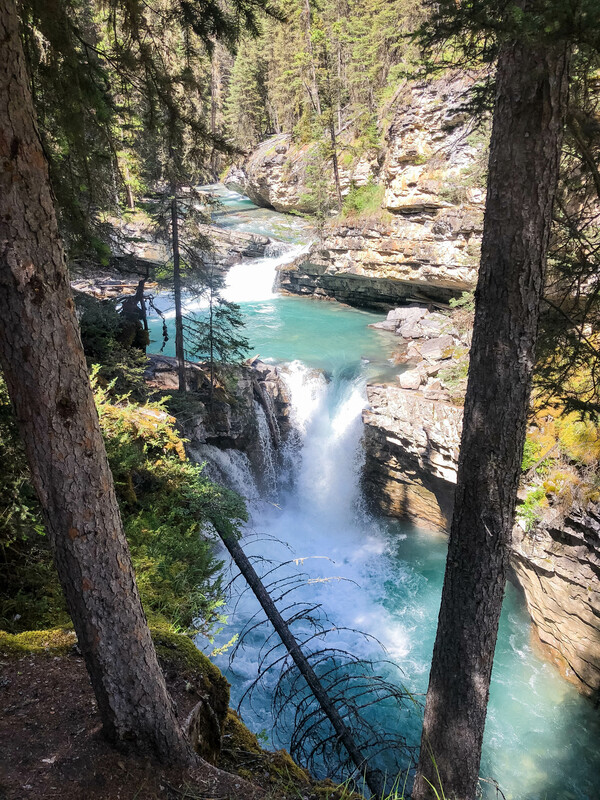 You can continue pretty far to the Ink Pots, but this was our 3rd hike of the day so we turned around at the upper falls. 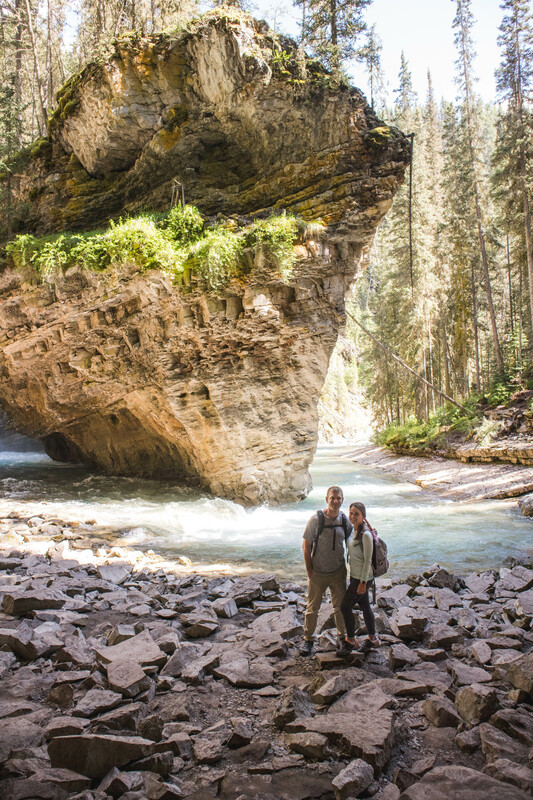 Thanks to some researching on Instagram, we made it our mission to find the secret cave. I found pretty detailed directions from this blog. You have to go off the trail and scale down some rocks, but it’s worth it and you can cool off by the waterfall. And last but not least, the most strenuous hike of our trip. 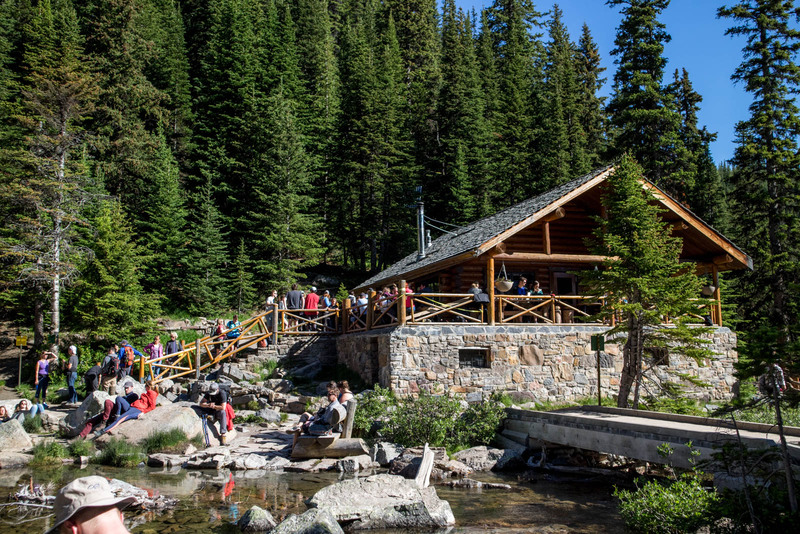 There are several hikes around Lake Louise but we picked this one because it’s a 3-4 hour hike and at the top you are rewarded with tea and snacks at the Lake Agnes tea house. 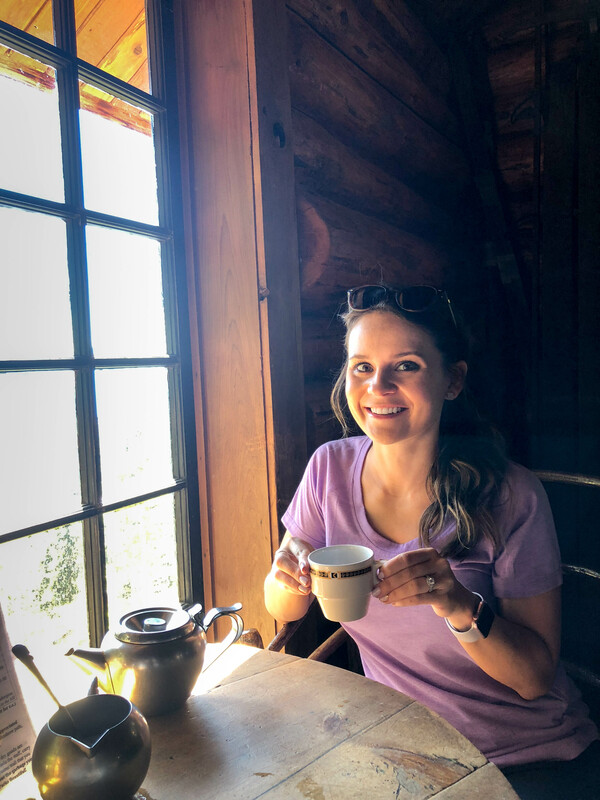 It’s the cutest log cabin that has no electricity or running water- the staff hike up the trail to work and get all the water from the lake, I saw a guy with a tea kettle filling up with glacial water right outside… how cool is that?! Ps. They only take cash. 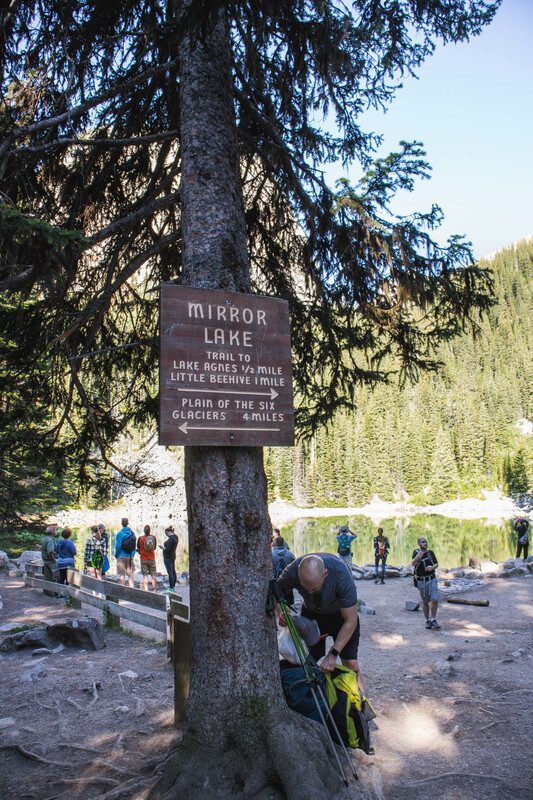 The hike was pretty strenuous, the elevation gain is about 1,300 feet and your final altitude reaches over 7,000 feet. I definitely got a little winded on the way up but it was so worth it. There are longer hikes if you keep going, but this was long enough for us. We learned that you can also ride horses up this trail if you want a break from hiking, maybe we’ll take advantage of this next time! 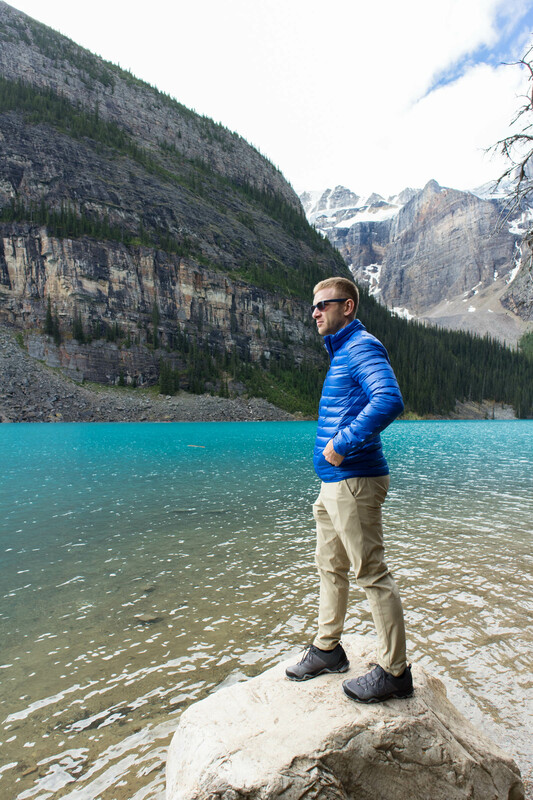 This is probably the most popular lake to visit in Banff National Park so we decided to do some exploring after our hike. 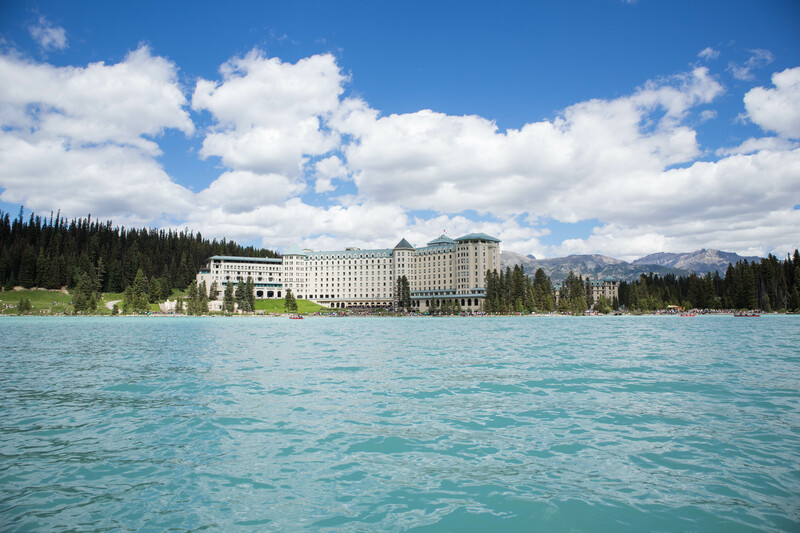 We changed out of our hiking gear and had lunch at Alpine Social at the Fairmont Chateau Lake Louise. 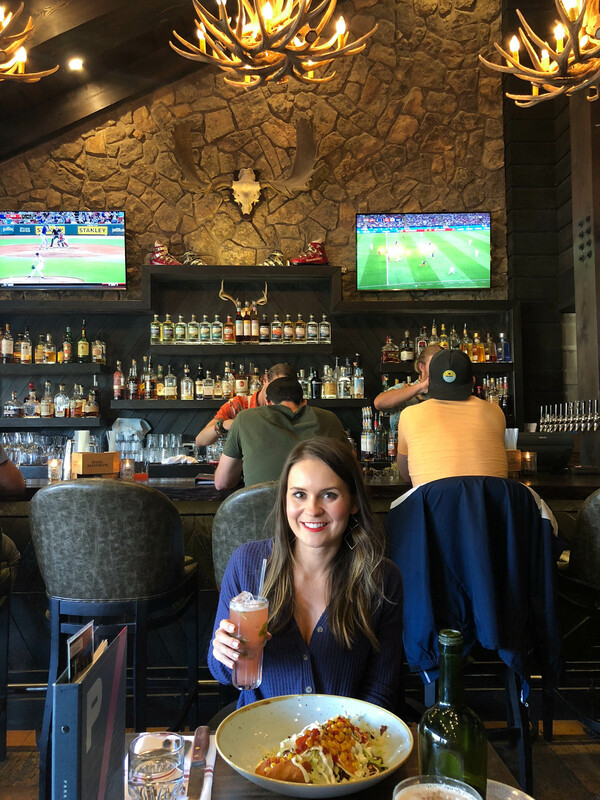 Try to get a table on the patio for some of the most gorgeous views of the lake. 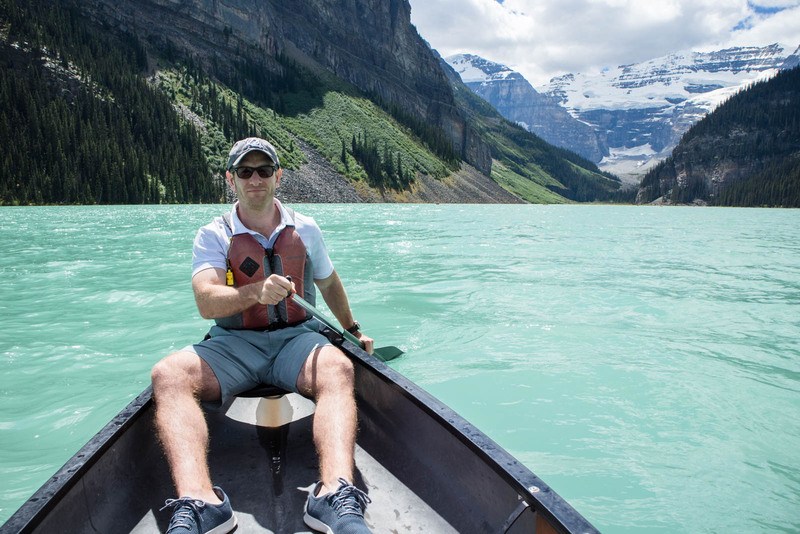 We also went canoeing on the lake for an hour which was definitely on the bucket list. I will warn you it’s pricey, but kind of like riding a gondola in Venice, you just have to do it! You can see below how the sun has an effect on the appearance of the water- the first photo was taken about 8:00am and the later photos were after lunch. 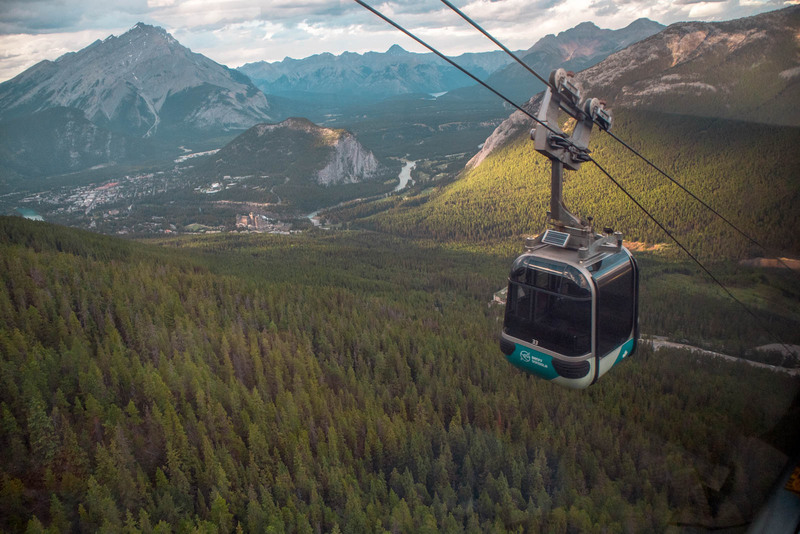 On our last night we took a ride on the Banff Gondola up 2,200 feet to the summit of Sulphur Mountain. The ride to the top is about 8 minutes long and I’m not afraid of heights… but this was so high!! 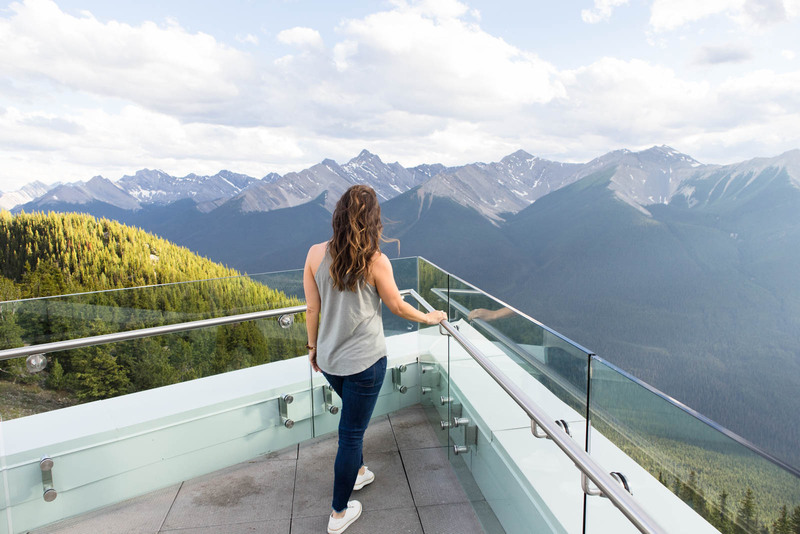 There are incredible mountain views at the rooftop observation deck and you also have your choice of dining at one of the two restaurants. While we were there they were having a sunset festival with live music- it was definitely less crowded in the evening so I think that’s the perfect time to go! 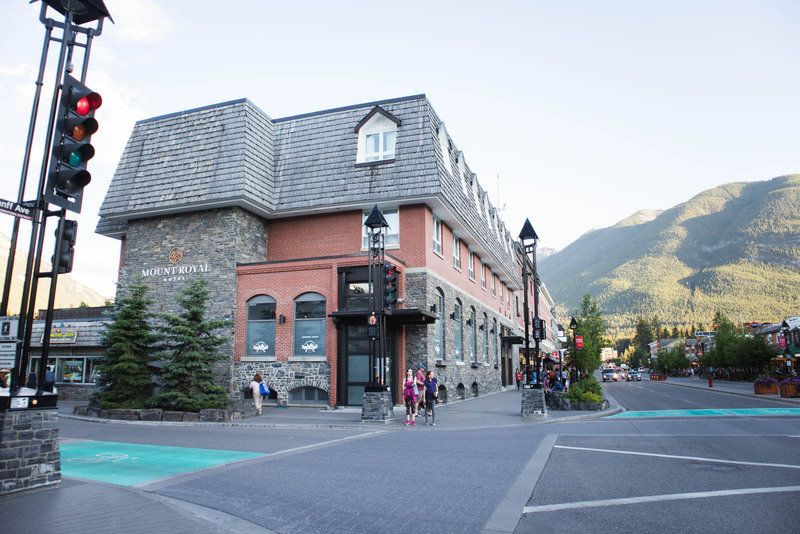 We didn’t arrive to Banff until around 8pm so we quickly checked into our hotel and ran across the street to find dinner. 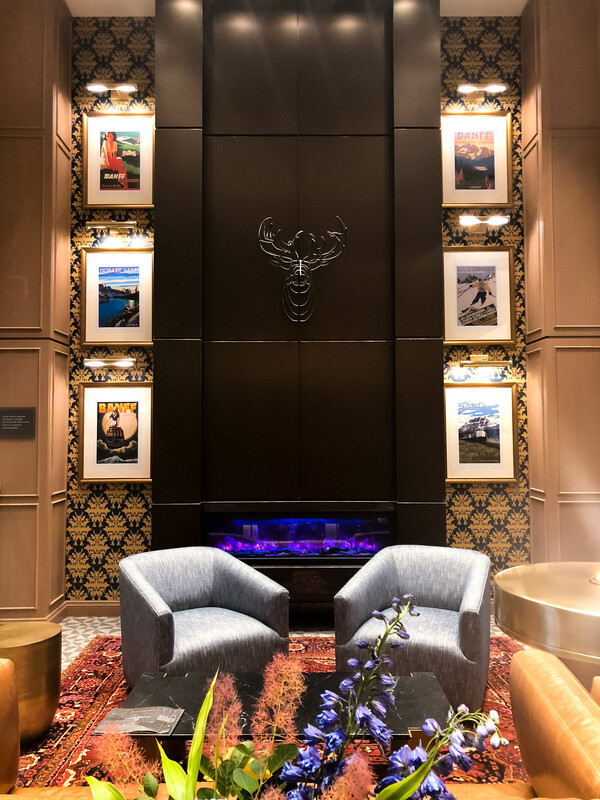 The Maple Leaf Grill is located in the King Edward Hotel and we were so impressed with the food. I recommend the lobster risotto and cast iron beef short rib. Best cocktails- hands down! This distillery makes their own vodka, gin and rye and I recommend the Bankhead. 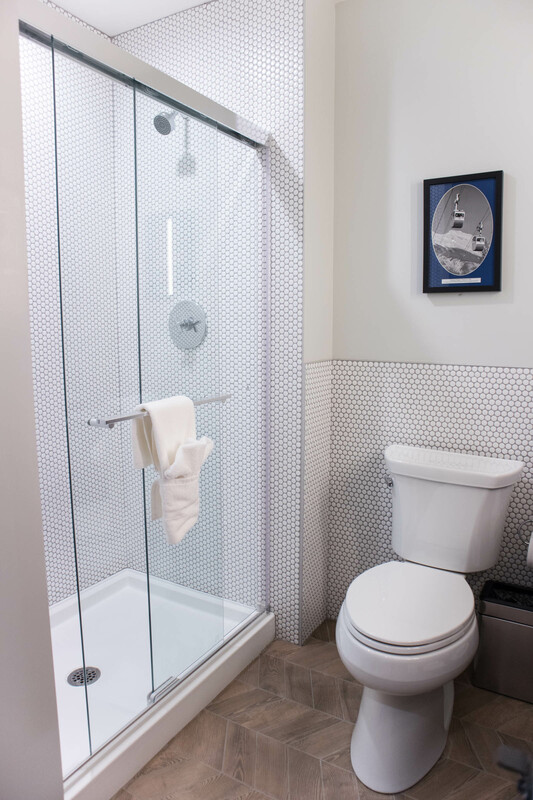 It has the cutest decor and has an inside/outside feel. We ordered the poutine (when in Canada, right?) and it was delicious!! This is a great lunch spot in downtown Banff- we had the quinoa & avocado power bowls. Definitely recommend grabbing a seat outside for people watching! We loved this place! 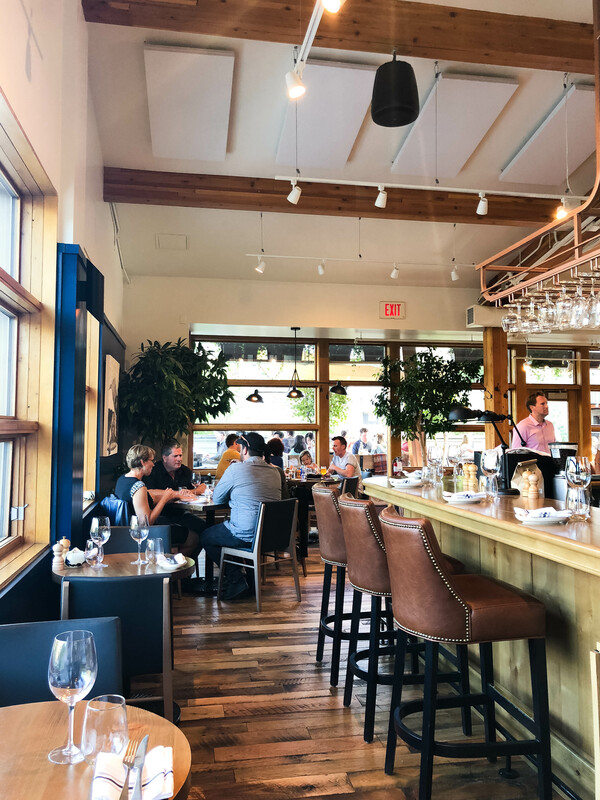 Everything is sourced locally from western Canada and it’s super cute inside. 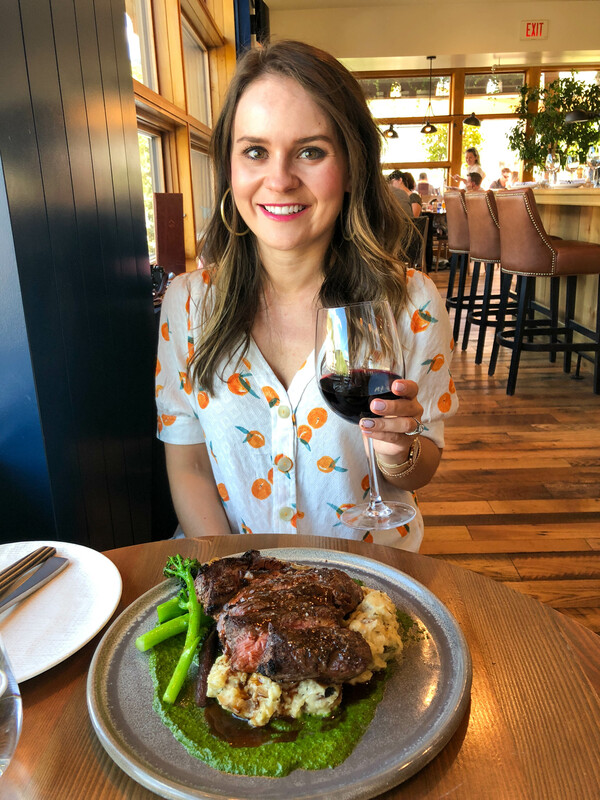 You have to get the bison- Ryan is the steak connoisseur and he said it’s one of the best steaks he’s ever had. We split the ribeye and and appetizer and it was more than enough food! We ate here the last night of our trip, definitely had more of a bar vibe. 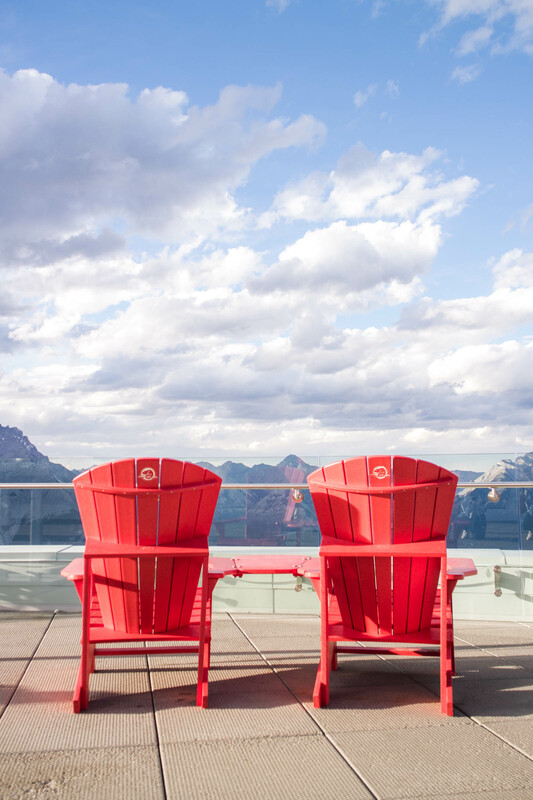 I recommend to get a seat on the rooftop patio, it was so nice up there! They are known for their ribs so that’s what I ordered and they were delicious! In the summer, the sun rises at about 5:30am and sets at 10:30pm which we loved because there is more daylight for activities! 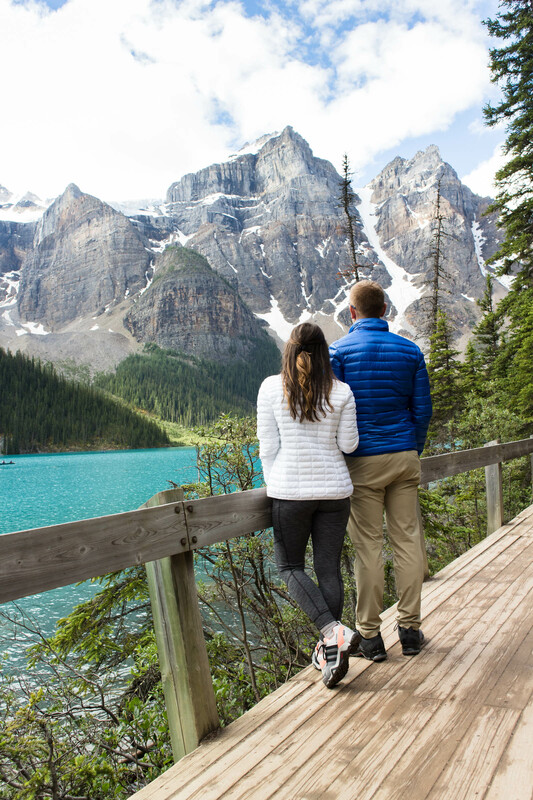 The closest airport to fly into is Calgary, then you have a 1.5 hour drive to Banff so this is a trip where you’ll definitely need to rent a car. The drive isn’t bad thought because it’s so scenic! Some things are actually cheaper because of the exchange rate between Canadian and US Dollars. For example, Lululemon prices were the same as US prices in CAD which saves you approximately 30%! However, make sure you have a credit card that doesn’t charge foreign transaction fees. 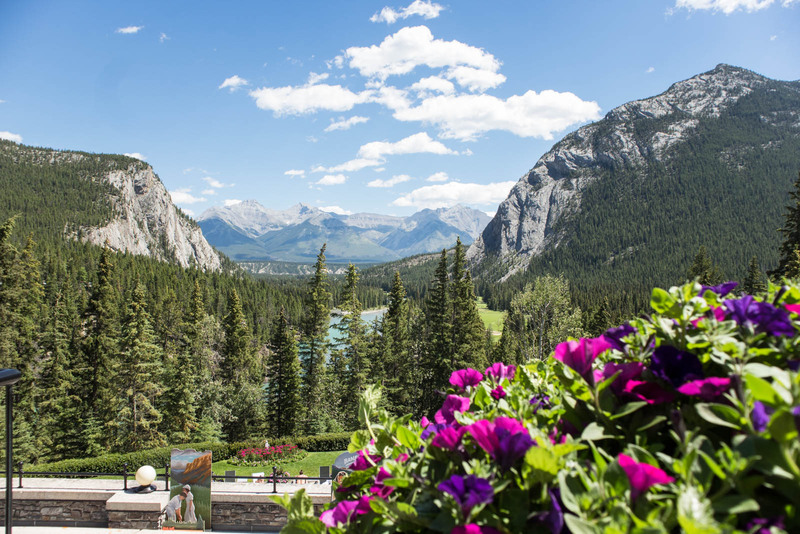 If you stay in Banff, I would venture over to the Fairmont Banff Springs for drinks and a view. This hotel looks like a castle (Hogwarts, perhaps?) and the views are incredible. Don’t forget to purchase your park passes before entering the park (we almost forgot this part). 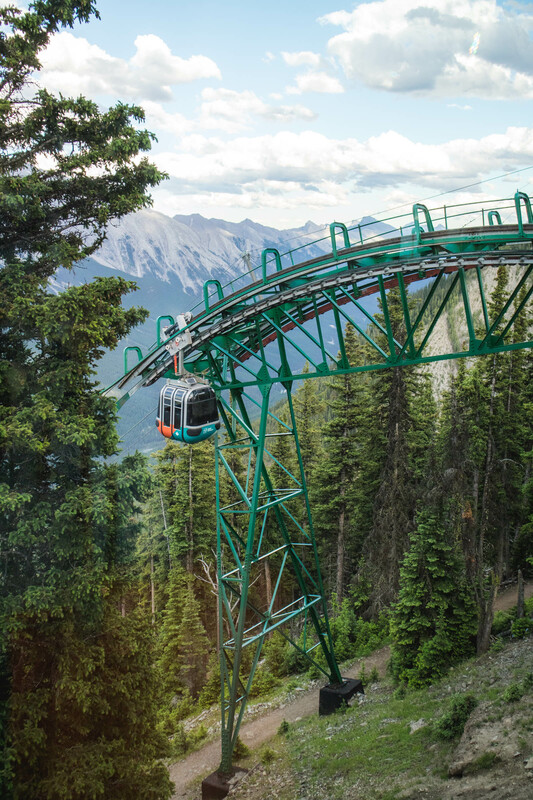 On the road into Banff there is an area where you can pull off and get your passes and you must display them on your dashboard whenever at the park, or you risk getting a ticket/fine. You can also get them at the visitor’s center downtown or print them off prior to your trip at home. 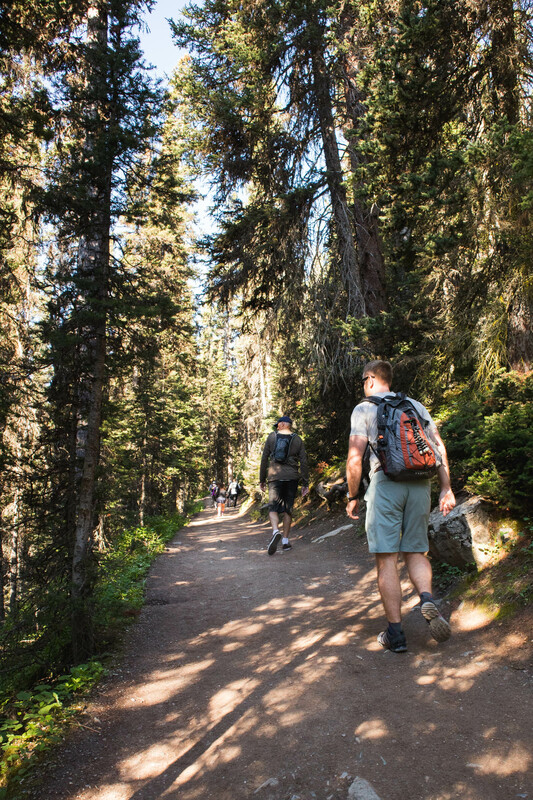 Everyone says you need bear spray but it’s something you hope you don’t have to use. We found a convenience store that let us return the unopened bottle for about 70% of our money back. I know that was a super long post but I wanted to include all the details- if you have any specific questions don’t hesitate to email me to shoot me a DM on Instagram. Also, later this week I will have a video recap of our trip so be on the lookout for that. I absolutely love making travel videos, but it definitely takes a lot of time and I am somewhat of a perfectionist so I promise it will be good! Thanks for reading! I’m amazed by the color of the water! So beautiful! 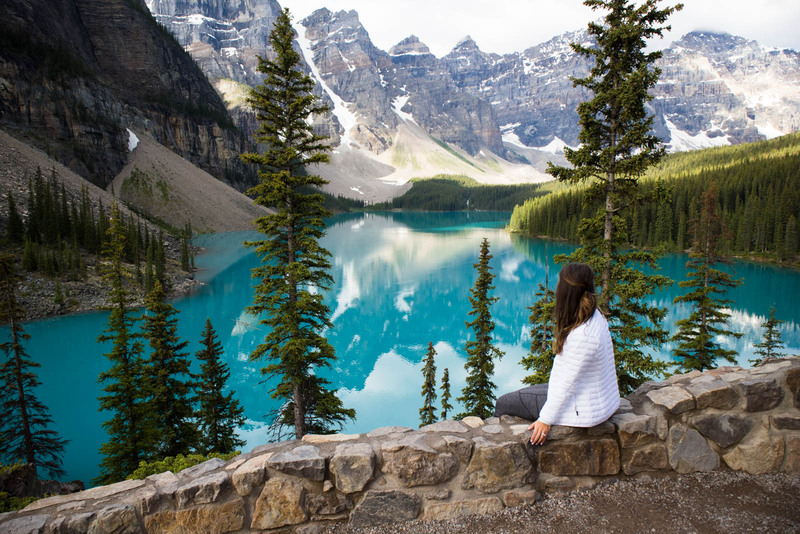 Banff is on my bucketlist and your guide is so helpful! I love that there was more daylight! You should definitely visit- you would love it!! 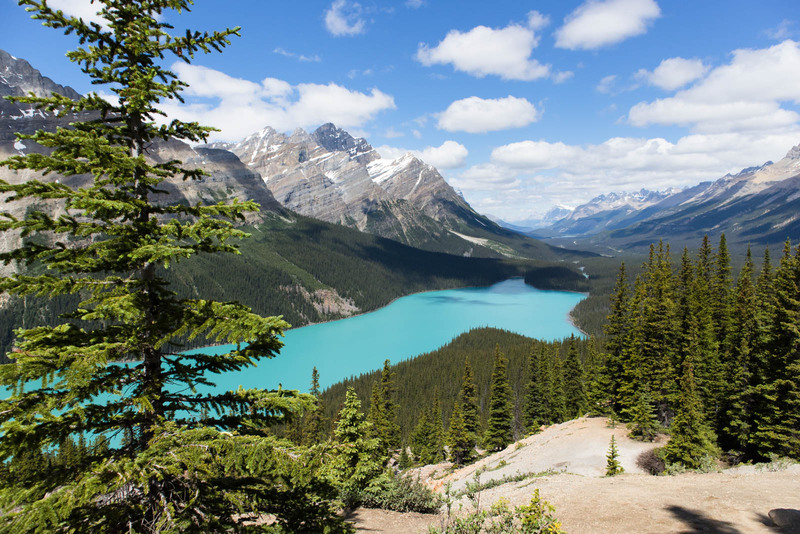 Banff looks like the most beautiful spot! Your photos are absolutely stunning. It’s on my bucket list to get there!! Thanks girl, it was truly so beautiful and I can’t wait to go back! Oh my gosh, this looks absolutely gorgeous! 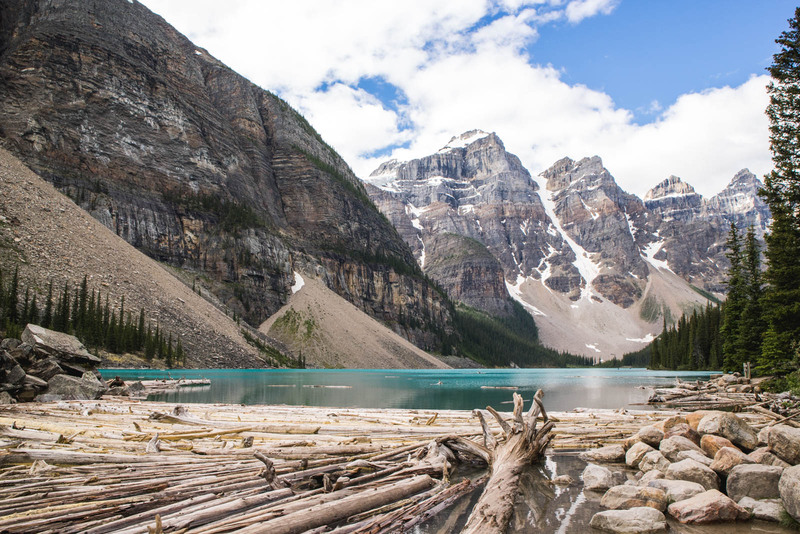 A few friends have visited Banff recently which has made me want to go even more, now! Definitely need to add this to the travel list. Thanks so much for sharing this guide! 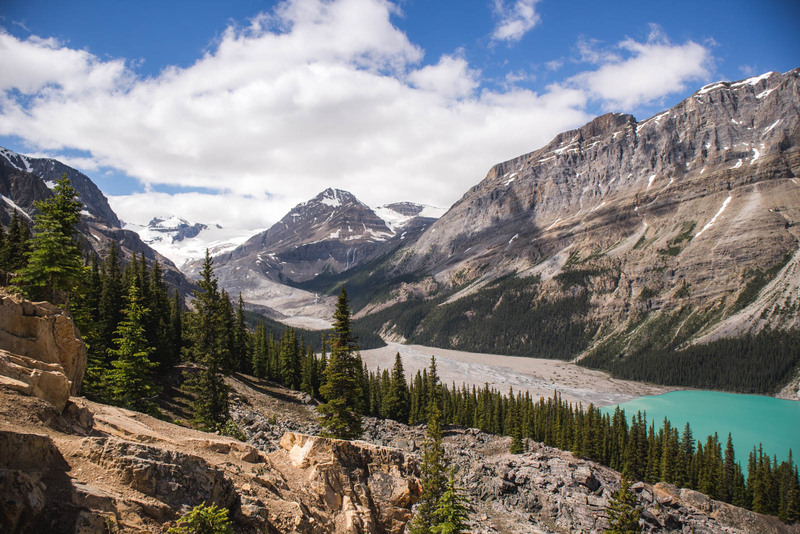 Banff has been on my list for AGES – I live in Vancouver so it is so close that i can’t believe I still haven’t gone. 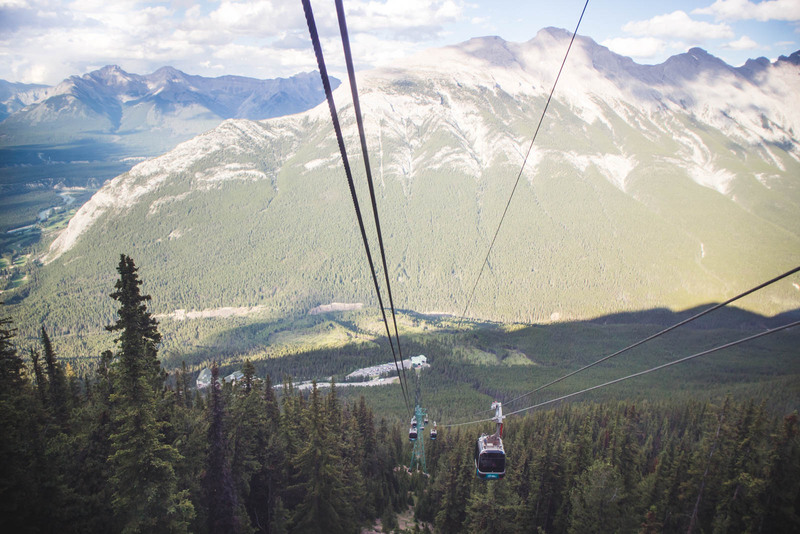 I’m bookmarking this for when I finally get my Banff trip booked. 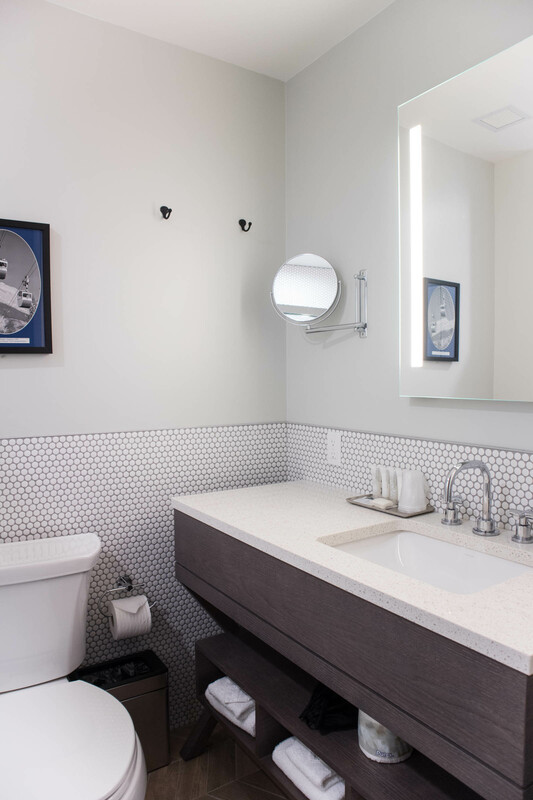 The Mount Royal hotel looks great! GIRL this post is SO good and OMG you’re photos are amazing! Definitely bookmarking for a later date when we visit. Also, can’t wait to chat about it when we get together! What a gorgeous trip! It looks like y’all had the best time. 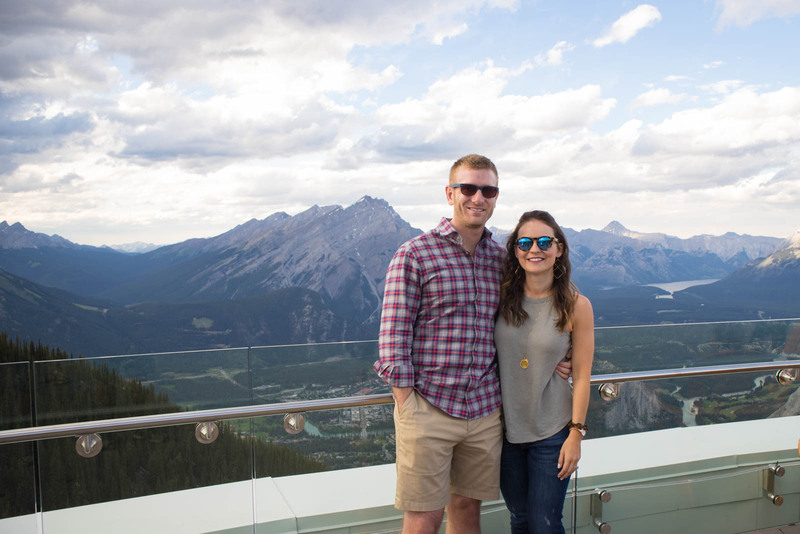 We are planning a special trip for our 10th Anniversary and you’ve sold me on Banff! It’s gorgeous and I hope you had a wonderful time! This looks like such a beautiful trip! I need to add this to my list of places of visit. It’s breathtaking!! 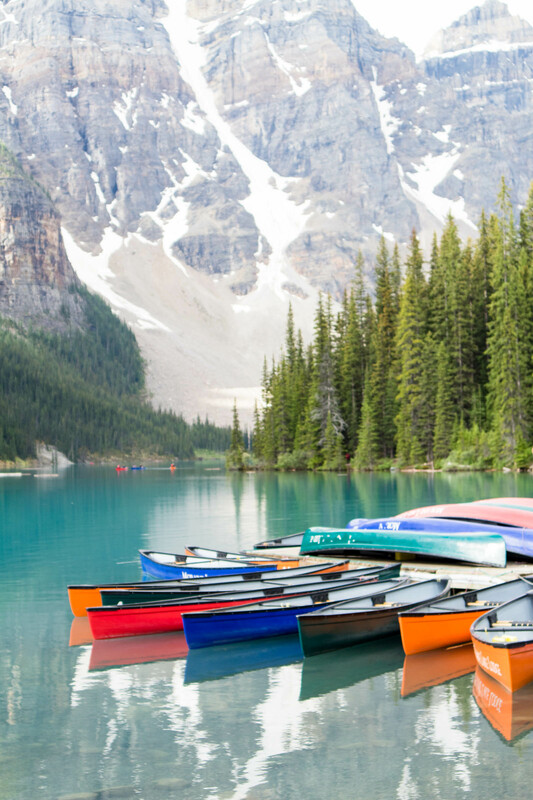 Oh my gosh Banff is definitely on my bucket list!! I can’t get over how gorgeous that lake is!!! Thats a great travel location. Looks like such a fun time! 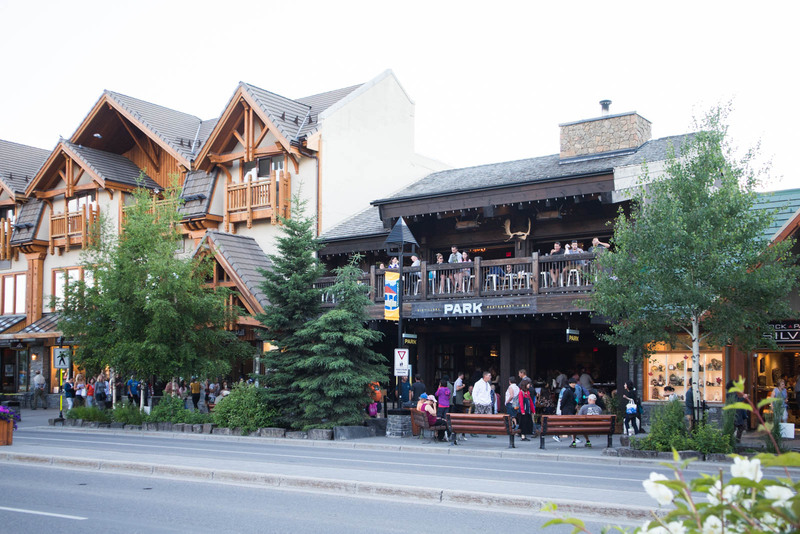 Did you go into Canmore at all? We were looking for condos and it looks like there are a lot more condos/houses in Canmore than Banff. A bucket list trip for me!! Saved this!